This Reef Bark Organic Fine Weave Wool Scarf contains sophisticated hues in a stunning pattern inspired by the photography of light shadowing the bark of a giant oak tree in the Huntington Gardens in San Marino, California. It is amazing how much the bark on the back of a giant oak depicts the complexity of a coral reef. This fashion scarf is the perfect accessory. Wear it as stunning evening wrap for that special occasion or all day for a unique burst of color in any ensemble. 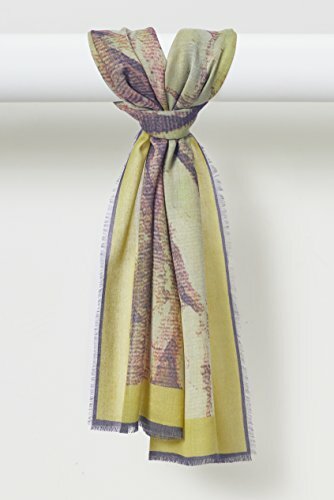 Each painterly scarf measures 17″ x 72″ in 100% organic fine weave wool. Made in the USA. Variation in printing & color are hallmarks of digital printing with natural fiber-reactive dyes. Due to the nature of the materials, no two pieces will be exactly alike. If you have any questions about this product by Louis Jane ("Where Nature Meets Art"TM), contact us by completing and submitting the form below. If you are looking for a specif part number, please include it with your message.